Successfully Added NVR Property Surveillance Kit - Nightvision, Waterproof, HDMI, 4x 1/4 Inch CMOS Sensor 720p IP Cameras, PoE, Linux OS to your Shopping Cart. Protect your property with this state of the art NVR surveillance system. Unlike traditional DVR systems that store data on the device itself this NVR surveillance system operate through the local network to send and receive data, allowing you to fully operate and control the system remotely. This NVR surveillance system is ideal for persons who are searching for a security system that can be operated from their computer, Smartphone, or tablet. IP cameras are the cutting edge of surveillance technology – including a NVR in to your system allows you to increase the number of cameras you are using and gives you the opportunity to add more advanced features to your surveillance network. With its four 720p camera’s, embedded LINUX OS HI3515 Operating System, as well as a 1.0 mega pixel 1/4 inch progressive scanning CMOS sensor this NVR kit offers you the ideal means to control multiple cameras from one central location. By controlling your surveillance system remotely and using the cloud to store your data you now can store more video’s for a longer period of time and record larger HD video’s as compared to traditional DVR systems. This NRV kit furthermore allows you to set motion detection areas and alerts which will automatically inform you through an e-mail or text message when something seems out of the ordinary. Remote playback and video browsing allows you to check saved files or live broadcasts from all your surveillance camera’s without having to be at the actual location of your surveillance system. Additionally its Power over Ethernet (PoE) feature transports electrical power along with data over the Ethernet cabling. This allows a single cable to supply both data connection as well as an electrical power supply to the IP cameras. No longer will there be the need to find a power source and plug in your power cables at inconvenient places. With PoE all that is required is to connect the data cable of the surveillance system and power will be delivered to the system simultaneously. 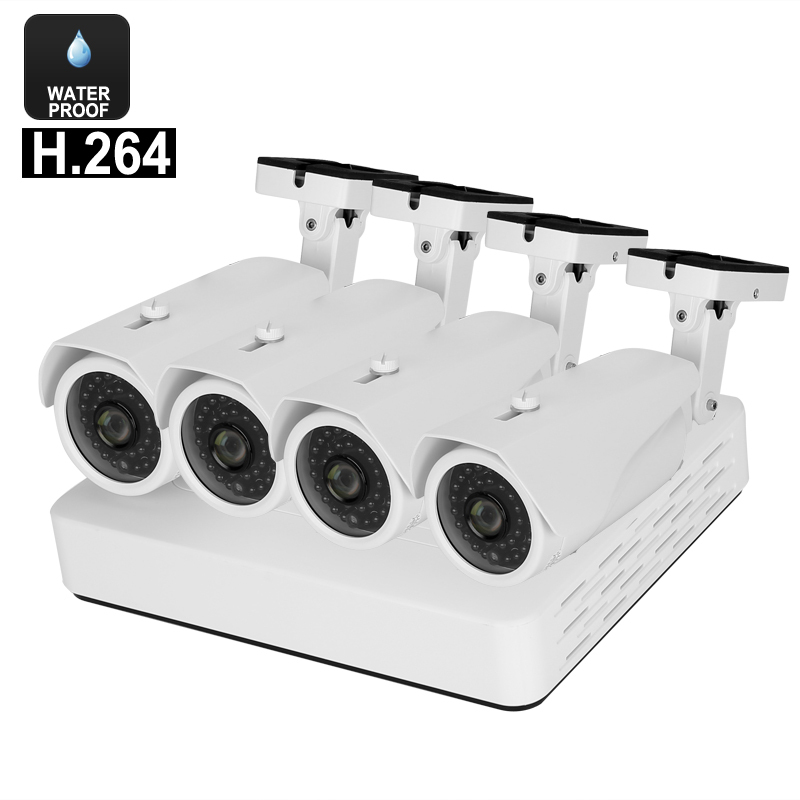 Each camera has an IP67 waterproof rating making them perfectly capable of operating in both indoor as well as outdoor environments. With its IR distance ranging up to 15 meters each camera offers a remarkable area of surveillance during both day and night time. This NVR surveillance kit offers great protection to your house, office, garage or any other property – significantly increasing the safety of your loved ones and / or assets. This NVR Surveillance System comes with a 12 months warranty, brought to you by the leader in surveillance systems as well as wholesale electronic gadgets..
Arabic: - أمن الوطن NVR كيت - Chinese Simplified: - NVR 家庭安全工具包 - Czech: - Domů bezpečnost NVR Kit - Dutch: - NVR huisveiligheid Kit - French: - Sécurité à la maison NVR Kit - German: - NVR-home-Security Kit - Hebrew: - NVR אבטחה בבית קיט - Hindi: - NVR घर सुरक्षा किट - Hungarian: - NVR otthoni biztonsági készlet - Italian: - Sicurezza domestica NVR Kit - Japanese: - NVR ホーム セキュリティ キット - Korean: - NVR 홈 보안 키트 - Malay: - Keselamatan rumah NVR Kit - Norwegian Bokmål: - NVR hjem sikkerhet Kit - Romanian: - Securitate acasă NVR Kit - Russian: - NVR домашней безопасности Kit - Spanish: - Seguridad para el hogar NVR Kit - Thai: - รักษาความปลอดภัยบ้าน NVR Kit - Turkish: - NVR ev güvenlik seti - Vietnamese: - An ninh NVR Kit.